- Dispellable debuff highlight for party and raid frames. - Raid debuff icons on raid/party frames. - yj589794, Caellian, Neverg, Coree and Monolit. Most of the original code came from their layouts. - Portraits are not showing properly for worgen characters, that's blizzard's fault. - Debuff highlight colors are sometimes wrong. - Runebar insists on displaying imaginary deathrunes. - Not a bug, but new raidDebuffs icons are still to be added. - Ingame config turned out to bring more problems than solutions so I decided to take it out, at least for the time being. - There's something really wrong in my code and I simply can't figure out what it is. This one thing is messing up many stuff, like runebar's crazy deathrunes and wrong debuff highlight colors. I had added support for oUF_Experience and oUF_Reputation but took it out because some tags were driving me mad (like, disappearing with no reason) and I bet this was caused by this same problem. I'm trying to fix it but you are more than welcome to check my code and help me out. This is my personal layout and it's *not* finished so expect many improvements and layout changes in the upcoming versions. Corrected some wrong AuraWatch spell ids. is it possible to have boss frames show debuffs under the cast bar rather than to the right of it? Hello, Is it possible to see the numbers you use for the different class colors? If i want to make something else in my UI the same color as the one in your unit frames? Any chance you are going to update this layout for MoP? Playing with my hunter today I noticed the energy bar on the player frame was not updating. The text showed the correct amount but the bar stayed full. perfectly been using Ouf for wow. Perfect for solo & raids. I have a question on modifying your layout. 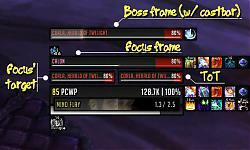 Would like to know how can i enable player(self) & target buffs & debuffs under the frame as in default place. any changes or updates ahead? just wondering if there are any plans for updates or changes in the works. thanks again for your layout ! How to display 8 groups when I in battle? I set the cfg.raidShowAllGroups in cfg.lua to true, but it didn't take effect. BTW, what's the different between cfg.raid and cfg.raid40? Last edited by 6954658 : 10-26-11 at 12:38 AM. Im using 2 different UnitFrames-Layouts for my compilation, easily done by kgpanels and Reflux, but Reflux doesn't work (oUF has no layouts obviously) and if I try to rearrange the UnitFrames with "uOF_drk_player:ClearAllPoints()" and "oUF_drk_player:SetPoint("CENTER", UIParent", "CENTER")" (jsut as an example) within a onClickHandler and kgPanels, i get something like "attempt to index global oUF_drk_player (a nil value). Is there a way to emulate an profile (which, I think, is atm impossible 'Cause setting are in "core.lua" and not in a SavedVariable....) or to change the values with kgPanels? Last edited by FaulTier : 09-01-11 at 01:05 AM. I *think* I have it. I used the co ords from kgpanels in place of the "0, 150" in the oUF_Drk lib lua in my addon folder.. saved changes .. fired up wow ..grabbed somebody from guild to "party" up with .. found a target ...and voila !! the threatbar to exactly where I want it. I am keeping the original backup I saved to desktop for a little while ..."just incase"
Last edited by Helln_HiHeels : 08-28-11 at 09:40 AM. A cool feature but I can't find where the coords for moving it are in the Lua config. Does anyone know how to move it? And yea I've tried OMF to move it. I'm looking to find a way to move it as well .. oUF_ThreatBar can be found in the "PlugIns" folder in oUF_Drk ..
Last edited by Helln_HiHeels : 08-27-11 at 09:04 PM. Is there a way to increase the frequency of my power bar and health bar updates? Right now it counts up energy on my rogue in increments of 20. I'd like to have it count up in real time as I regenerate energy, and I can't find any setting that controls the update rate. I've created this addon to fulfill my needs but I decided to make it public because I think many people will like it and use it. If you are one of these persons and want to thank me and support further development by helping me pay my monthly fee, feel free to donate something. PS: The donate button will appear after you click the download link.